SLR cameras don’t seem too heavy. But if you’re walking around with one all day, it can start to feel like you have a millstone around your neck – especially if the camera is outfitted with a telephoto lens.Eventually, I started lugging mine around in my backpack and drawing it out when I was ready to shoot. But that proved to be a bit of a struggle as the camera’s shape and protrusions were never seated properly in a bag designed for laptops, books, or softer, crushable items. And I wasn’t comfortable with the idea of placing other loose items inside that would make contact with the camera. That’s where the Lowepro Fastback 250 excels. This backpack is specifically designed for photographers. 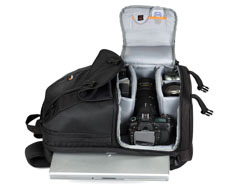 A side-entry pocket on the bottom securely holds different sized cameras and lenses along with padded compartments for additional lenses and accessories. Affixed with Velcro, these compartments are adjustable to fit your specific gear.There’s also a flat compartment into which you can slip a 15.4″ laptop. A very handy feature. For 17″ laptops, Lowepro offers the larger Fastback 350 model, although my 250 model had no problem accommodating my 17″ laptop.The top pocket of the Fastback opens so that you have a wide compartment for other accessories. Inside are enclosed and mesh pockets for other small items as well as slots for pens and pencils. The outside of the pack has additional storage pockets.The shoulder straps are well padded with a built-in cell phone pocket, though it’s far too narrow to hold a combination PDA/phone such as my Palm Centro or an iPhone. There is also a padded belt you can secure around your waist to help distribute the weight more evenly. Of course, the Fastback sounds good on paper and it looked real nice in the store. So, within days of my purchase, I tested it in a real-world situation. I packed the Fastback with 12 pounds of camera gear and took a briskly-paced seven mile hike in Mohonk Preserve (New Paltz, New York) – half of those miles were going up a steep thigh-busting hill. It didn’t take long for the 12 pounds to feel more than twice that amount. But the Fastback was pretty comfortable, and I was able to access my camera much more easily than with my standard-issue backpack. I simply pulled the strap off my shoulder, swung the Fastback around toward my chest and unzipped the side-entry compartment that nestled my camera inside.The camera, though, does not rest flat against the inner padding. My Nikon has a rounded contour on the right side with which to grip the camera. This bump tilts the camera against the padding so that it’s askew. I would have preferred a more custom fit but, after 7 miles of jostling, the camera remained snug and secure. One nuisance was what to do with the camera strap. Mine is wide and padded for comfort. So storing my camera into the Fastback’s side-entry compartment was a bit like forcing Jack back into his box. The bulky strap would poke out before I had a chance to zip it back in. Removing the strap and refastening it later is not a practical option. It would have also been great if there was a way to carry a tripod or monopod, perhaps with one or more Velcro loops. The Fastback is more spacious than it looks. I still had plenty of room to bring a lot more gear. But bringing my monopod took a bit of creative packing. Eventually, I removed the head of the monopod and stored it in the top compartment. As for the rest of the decapitated monopod, I was just barely able to fit it into the broad pouch intended for a laptop – its stumpy neck stuck out of the top with the zipper keeping it in place. After reaching the summit, I finally had a chance to remove the Fastback and set it down for a short break. Despite the weight and bulk of the contents and the uneven ground upon which it rested, the Fastback did not topple over as what would have happened with my old backpack. The Fastback is constructed with a flat bottom that keeps it anchored to the ground. I like that the bottom is padded as my camera and lenses are stored directly above it. As gentle as I was in setting down my old backpack, it was often greeted with a cringing thump – never a good thing for a laptop’s hard drive. The hike back downhill was easier. It was soothing to hear the nuts falling from the trees like manna from squirrel heaven as the rain hissed and pattered on the leafy canopy. And that reminded me that as wet as I was getting, all of my gear remained dry because the Fastback is fully lined inside. Ironically, after an arduous day like this, I hardly took any photos at all. I fired off maybe four or five mediocre shots at the summit. There really wasn’t time to set up, make settings, compose the frame and shoot. I was with a group of about 15 and they take their hiking seriously. Their pace is quick and deliberate. If you lag behind, you face the embarrassment of the Alpha Hiker stopping the pack to wait for you to catch up – chest to the ground and tail between the legs.